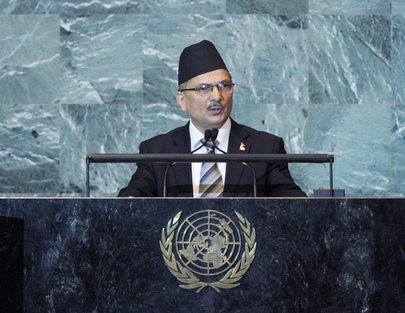 BABURAM BHATTARAI, Prime Minister of Nepal, said that his country was undergoing a momentous transformation. Indeed, following a period of persistent struggle, a “feudalistic and autocratic monarchy has been abolished”. Nepal had entered a new era with the creation of a federal democratic republic, and today, the new State apparatus was striving to take into account the country’s multi-ethnic, multilingual and multicultural diversity. The ultimate aim was to abolish all discrimination and oppression based on class, gender, nationality, religion and caste, and to create a just and democratic system. He went on to say that Nepal’s homegrown peace process and historic transformation could provide excellent examples for others. “We believe that transformation must be holistic to have long-lasting impact at the grassroots [level],” he said, explaining that such transition must include improvements in the political, social and economic spheres, and be based on dialogue and consensus building. While Nepal, like other countries, had suffered “transitional pains and delays,” it had remained united behind a vision to complete the process by striving for consensus among all political parties and stakeholders. On another matter, at a time when humanity was so much in need of peace, he appealed for the development of Lumbini, the birthplace of Buddha, as “the fountain” of world peace. In that regard, the International Committee for the Development of Lumbini needed to be reactivated as soon as possible. While the United Nations upheld the noble vision of peace, security, development and justice for all, “we have a long way to go to achieve this,” he continued. Conflicts still raged; deprivation deepened and sustainable development was denied to people all over the world. Calling for a focus on the root causes of such ills, he urged the United Nations to come up with a new and far-reaching development package. The world needed a new “Marshall Plan” for rebuilding post-war societies and promoting “bold, visionary steps” to ensure lasting development and peace. The least developed and landlocked countries faced severe structural constraints that hindered their development efforts, requiring specific attention, particularly in areas such as trade and infrastructure development. Moreover, such countries, including Nepal, faced challenges posed by labour migration, dependence on remittances and climate change, and he urged that the economic transformation of the least developed countries be placed at the top of the United Nations agenda.